On the basis of thoroughly grasping the Party's and State's guidelines on foreign language teaching and learning ​​in the national education system and recognizing the role and importance of foreign languages ​​in the task of building the Army and protecting the Motherland in the context of increasingly extensive international defense integration, exchange, and cooperation, in the past years, the Central Military Commission and the Ministry of Defense have always paid attention to leading and directing the promotion of foreign languages teaching and learning ​​in military academies and schools (hereafter referred collectively to as schools) and fostering to improve the standard of foreign language ​​for the cadres, officers, and warrant soldiers in the entire Army. Accordingly, the Ministry of National Defence has developed and submitted to the Prime Minister for approval and actively implemented the Project on "Training and fostering of foreign languages ​​in the Army in the 2015 - 2020 period and beyond". Specifically, on November 11th, 2016, the Ministry of Defense issued Directive No.89/CT-BQP "On a number of urgent tasks to improve the quality of foreign language teaching and learning ​​in the military school system," to strengthen the direction of the issue. Immediately after the promulgation of Directive No.89/CT-BQP, with the spirit of initiative and responsibility, the entire Army, first of all, the relevant functional agencies of the Ministry of National Defence and military schools have thoroughly grasped and seriously implemented through a number of synchronous and effective measures in line with their assigned functions and tasks. The Ministry of National Defence has established the Steering Committee for the implementation of the Project on "Training and fostering of foreign languages ​​in the Army in the 2015 - 2020 period and beyond". The Department of Schools, under the General Staff - The standing body of the Steering Committee, has led and coordinated with the agencies and units in investigating the current status of the foreign language proficiency of lecturers and teachers and the quality of foreign language teaching and learning ​​in military schools. On that basis, synchronous and effective solutions have been proposed and deployed to improve the quality of foreign language teaching and learning ​​in the Army. The Department of Schools and the schools have held several training courses and field trips for learning models of foreign language teaching and learning for lecturers and teachers. At the same time, revision of foreign language teaching and learning results ​​at a number of military schools has been conducted to draw experience. Additionally, resources have been mobilized and invested in the equipment for foreign language teaching and learning ​​for schools, especially those with high demand for foreign languages. To implement the instruction of the Ministry, the Military Science Academy has been collaborated with to develop and implement the Project on “Improving the quality of foreign language and international relations training at Military Science Academy in the 2016 - 2020 period". The Project is aimed at building the Academy as a leading foreign language training center of the Army, capable of evaluating foreign language proficiency and fostering foreign language lectures and teachers in accordance with the national and international standards. In order to create a motive force for promoting the movement of foreign language teaching and learning in military schools, the Ministry of National Defence has instructed the organization of the first English Olympiads of military schools in 2017 and directed agencies and schools to carry out research and preparation for foreign language graduation examination for officer cadets. In particular, the Ministry has allowed schools to supplement A1 subject group (mathematics, chemistry, and English) to military admissions in order to create an input high foreign language proficiency for the Army. For the schools, the implementation of Directive No.89/CT-BQP has been strictly directed and drastically and promptly implemented with several effective measures and solutions. Besides attaching importance to all faculties and departments of foreign languages and enhancing the training and fostering of high-quality lecturers and teachers of foreign languages, the military schools have actively renovated the contents and adjusted programs on foreign language teaching and learning, accelerated the application of information technology, and use of teaching and learning, and renewed examing and testing models for the evaluation of cadets’ foreign language proficiency with priority placed on investment in equipment and construction and consolidation of multi-purpose and specialized classrooms for teaching and learning of foreign languages. Concurrently, the military schools have introduced good models and practical and effective measures to improve foreign language proficiency of teachers and cadets. Consequently, a positive environment and driving force for learning and using foreign languages have been created. It can be seen that after more than one year of implementation of Directive No.89/CT-BQP, the teaching and learning of foreign language in military schools have seen remarkable progress. The result, however, is just the initial. The foreign language proficiency and pedagogical capacity of a number foreign language lecturers and teachers, the foreign language ability of officials and lecturers of other specialties are still limited. In some schools, the methods of foreign language teaching and learning and proficiency assessment have not been much renewed, which fails to create a real environment for communication and use of foreign languages. The provision of means and equipment for this work has been limited. A number of cadets have not been aware of the role of foreign languages, which results in low learning achievements ​​to meet the training objectives and requirements. Improvement of the quality of foreign language teaching and learning ​​is both an urgent and immediate task and fundamental and long-term requirement. It is one of the breakthroughs to fundamentally and strongly renovate the quality and efficiency of education and training in military schools and contribute to building high-quality human resources to meet the requirements on construction of the Army and performance of military and defense tasks in the new situation. Therefore, agencies and units, first of all the schools in the entire Army should thoroughly grasp the resolutions and instructions of the superior level on this issue to strengthen the leadership and direction of foreign language teaching and learning and well propagate, educate, and raise awareness and build motives and responsibilities for subjects, especially teachers and learners. Measures should be further implemented in a more drastic, synchronous, and effective manner to promote and improve the quality of foreign language teaching and learning. In the immediate future, the schools should review and supplement the contents and measures to implement the Project on "Training and fostering of foreign languages ​​in the Army in the 2015 - 2020 period and beyond" and Directive No.89/CT-BQP in accordance with the practical situation. In particular, special importance should be attached to the combination of training and fostering of foreign languages ​​and the implementation of the schools’ Action Plan in response to the Fourth Industrial Revolution (Issued under Decision No.889/QĐ-BQP on March 22nd, 2018 by the Ministry of Defense). In order to realize the set objectives, the military schools should actively overcome difficulties and promote the building and fostering of lecturers and teachers of foreign languages to ensure sufficient quantity and standardization of proficiency, capacity, and professional enthusiasm. At the same time, due attention should be paid to the training and fostering of foreign language proficiency for lecturers and teachers of other specialists, and this work should be put on the top priority. Moreover, the contents, programs and methods of foreign language teaching and learning and examing and testing models should be actively studied and renovated with importance attached to the application of supportive information technology in teaching and learning. Foreign language teaching and learning ​​should be oriented towards grasping grammar in association with developing communicative skills. On the other hand, the schools should focus on selecting, compiling, and completing foreign language teaching and learning curriculums and materials to ensure "standardization and modernization" and suit with the training levels and majors and military characteristics. Initiative should be taken in compiling foreign language textbooks for specialties to prepare all necessary elements and conditions to organize the foreign language graduation examination in accordance with the defined plan. While bringing into full play their achievements, the schools should intensify the coordination in experience exchange and assistance in foreign language teaching and learning and promote international cooperation in foreign language training. At the same time, breakthrough solutions should be introduced to establish and maintain the environment for learning and using foreign languages ​​in daily communication, especially improving the performance of foreign language clubs, constructing and replicating advanced models of foreign language teaching and learning. 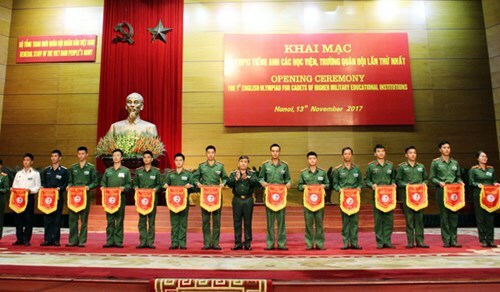 Cadres, lecturers, and cadets should be encouraged and motivated to promote their learning and following of Uncle Ho's example of foreign language self-learning, which will help create an extensive spread among the Army. Besides, relevant agencies of the Ministry of Defense, directly the Department of Schools should strengthen the coordination, guidance, inspection, and monitoring of the schools’ implementation of the Project on ""Training and fostering of foreign languages ​​in the Army in the 2015 - 2020 period and beyond" and Directive No.89/CT-BQP. Thus, difficulties and problems will be aware of and reported, and measures will be proposed for settlement. In the coming time, the Department of Schools will continue to coordinate and direct the military schools to promote the consolidation and standardization of the contingent of foreign language lecturers and teachers and well perform the work of foreign language teaching and learning planning to suit with each school and training major. In addition, other work will be well performed, including foreign language verification, review and study to establish the foreign language "output standard", maintenance and improvement of the quality of the foreign language Olympiads in​​ the entire Army, and pilot of international-standard foreign language training programs for division-level officers to create sources for overseas study and postgraduate training. Improvement of the quality of foreign language teaching and learning in the military schools is not only an urgent and immediate but also a fundamental and long-term task which should be drastically and persistently implemented with high determination, appropriate measures, and specific roadmap to contribute to realizing the objectives of training the contingent of officers with comprehensive quality to meet the requirements of building the Army and defending the Motherland in the period of accelerating the industrialization and modernization and international integration.